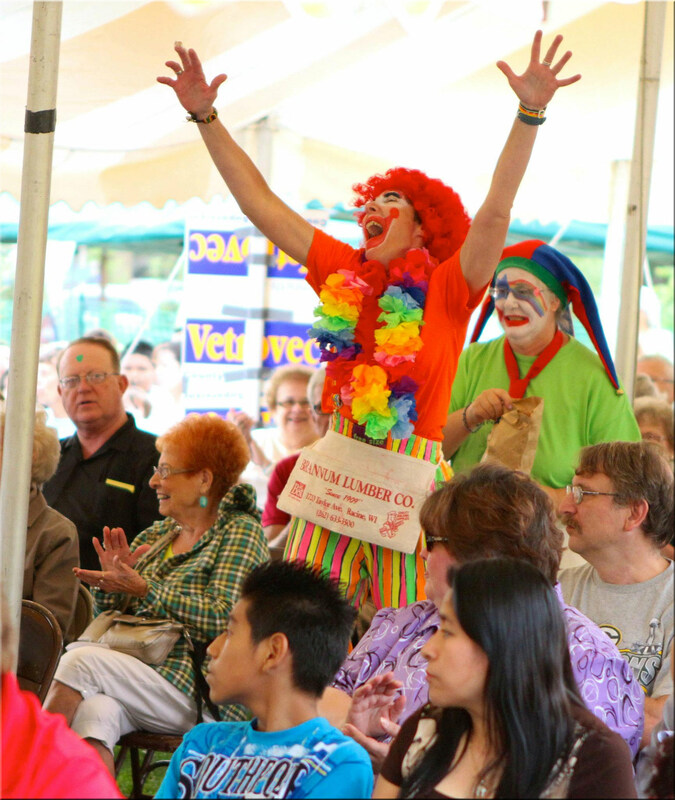 Warm and sunny weather blessed the crowds at the FaithWorks Fall Festival on the weekend of September 15 and 16. St. Andrew Lutheran Church was the host of the event, joining in the planning with representatives of Emmaus and Emaús, Atonement East and West, Our Savior’s, and Lutheran Church of the Redeemer. The theme of the festival was Feeding the Hungry: Body, Mind and Spirit. Non-perishable food items donated to the Racine County Food Bank were entrance to the event, and the nearly $700 in loose offering during the worship service was also designated for the food bank. 325 people attended the outdoor worship, led by musicians from Emaús, Redeemer and Atonement West. The mimed sermon was delivered by three clowns. The powerful message of abundance and the feeding of the 5,000 succeeded in transcending our existing language barriers. There were games, crafts, food, and vendor booths. Several people tried to see how long they could ride the mechanical bull. Various bands and singers entertained. A big thank you goes to all who made the festival a reality. Dozens of volunteers stepped in to plan, to provide baked goods and silent auction baskets, to sell tickets and recruit sponsors, as well as to prepare, set-up, run booths, participate in worship and to be on clean-up duty.